In late March of this year, I was contacted by Stewart Black of RodeoFuel to do an interview with Lance Crouch, Shane Duncan and himself on their podcast, then featured on the late www.twiturm.com ("Twitter Your Music"). I had stumbled across the RodeoFuel team on their twitter feed a week earlier, twitter.com/rodeofuel as they were posting run-by-run, ride-by-ride, round-by-round results from some larger IPRA events and was stoked to be one of their first podcast guests. We spoke about my rodeo and announcer background, my avoidance of in-arena incidents, crazy Quebec Rodeos, invitational rodeos, exciting Team Roping USA and the "Fat Guys Roping" to name a few topics. 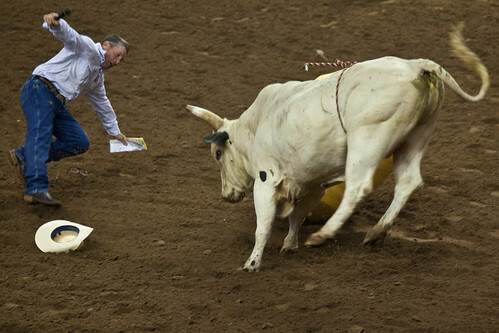 My favourite quote, "...anything with Quebec in it, I'm a fan..."
***Lesson 2 of 2 why I refrain from Announcing Rodeos in the Arena if Possible - Rob Smets Incident Pic - Bull hits Barrel, Barrel Hits Announcer ... almost a big of a hit as he would have taken as a Bullfighter!